During this year’s Make Big Noise PR event for select media in the Sporting Industry, I was delivered a “goodie bag” packed with eval items upon check-in at the hotel. The bag itself was also a “goodie” and was this TacProGear Covert Go Bag Light which I have been putting a beat down on since the event. 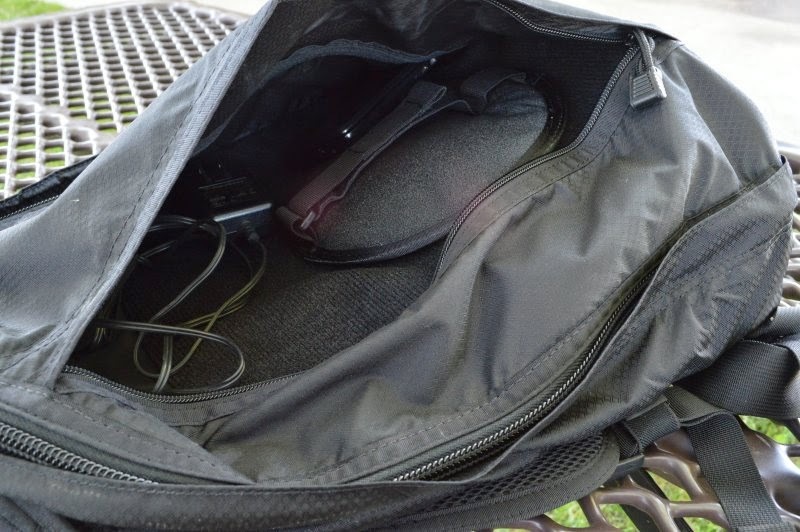 What is interesting about the TacProGear Covert Go Bag Light are summed up in two points: lightweight and covert looks. This pack is not particularly rich on those features found on MOLLE’ed and heavily pocketed packs simply because the entire pack is designed around the goal of being extremely lightweight. 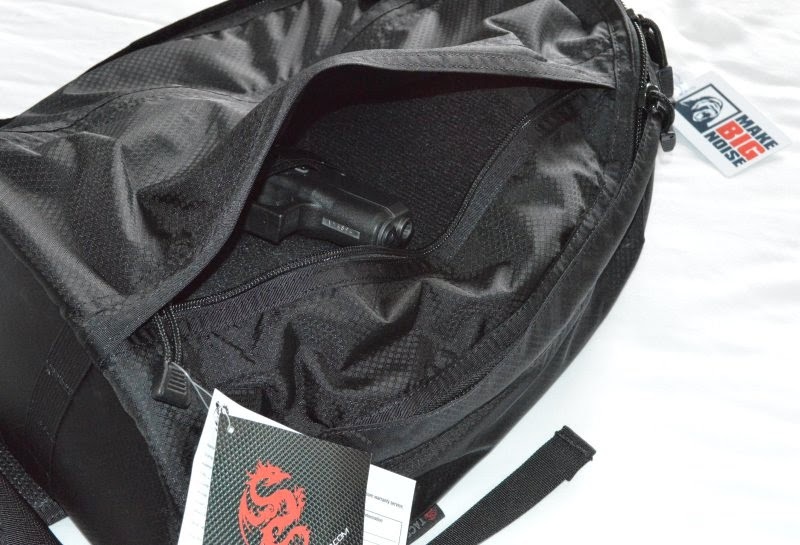 The other reason is that the plainer it looks, the less it screams “Hey over here I am a Tactical kinda guy and probably have a gun on me!” The Covert Go Bag Light is a very clean and concise design with only an exterior double sided CCW pocket and large main pocket. 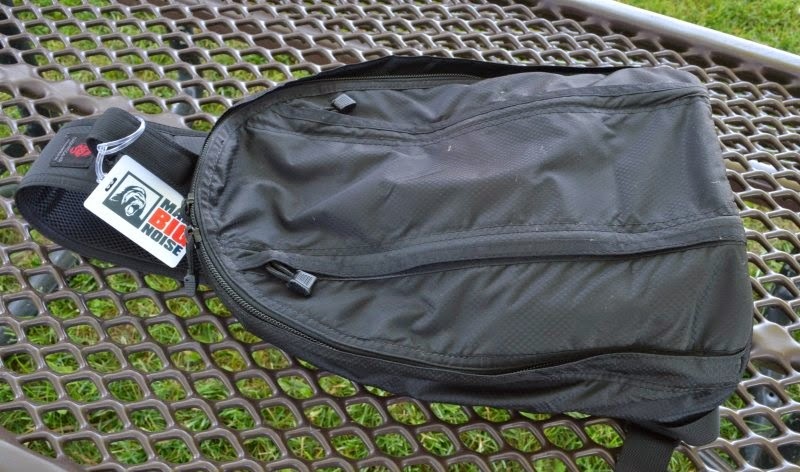 The Tacprogear Covert Go Bag Lite without MOLLE webbing was designed for a quick hike or trek through town all while providing CCW handgun carry. It features a lighter weight ballistic fabric and simpler design. To test this pack, I loaded it down with a full sized laptop and H&K P30L and lugged it various places to work on articles such as this for about a month. The minuses of this extreme lightweight design are less durability. Its a simple fact that you are not going to get the durability from this pack that you would with the heavyweight fabrics. In only a week I began to see some wear on the back bottom edge (a high wear area on any pack) from the heavy vintage laptop edges. I did not see any other heavy wear areas. 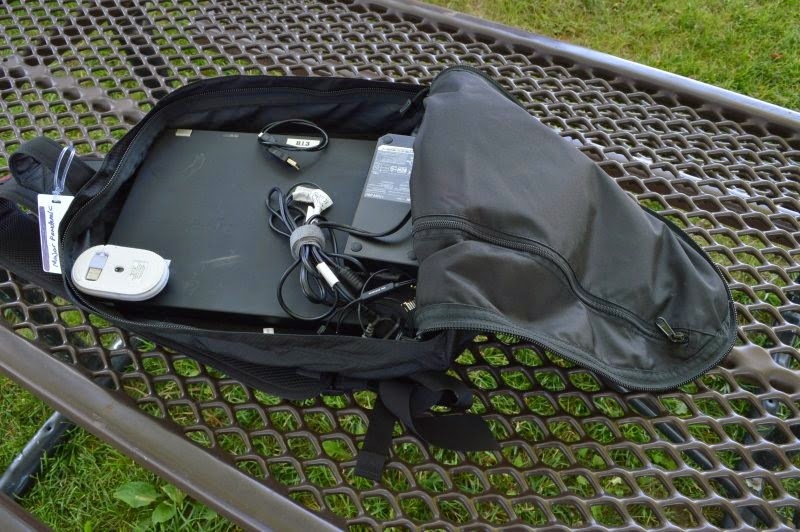 Its a lightweight pack, so I would not recommend loading it down as I did on a regular basis with a full weight laptop, but the new lightweight laptops should not be as harsh on the pack. The upside is that this is a great size that will accommodate large heavy laptops on an occasional basis and definitely would tote the lighter laptops and tablets with ease and could still have room to pack in a change of close or pair of shoes. 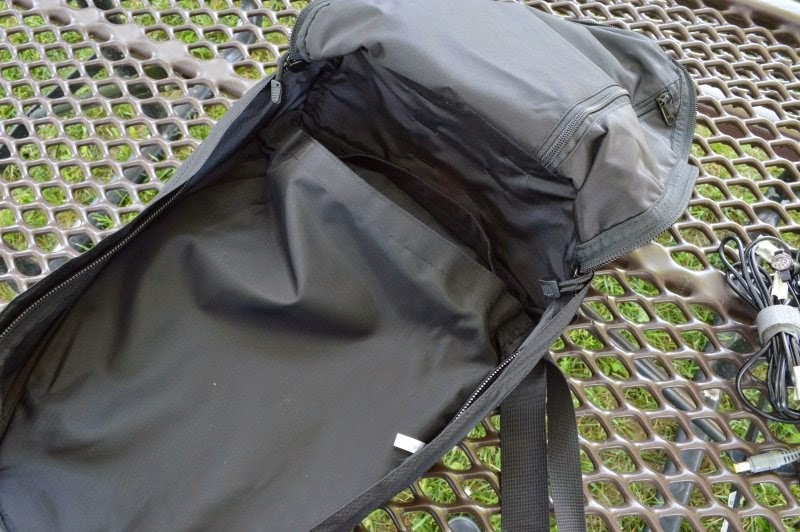 The TacProGear Cover Go Bag does is not particularly feature rich beyond its ultra-light weight, however it does have some thoughtful features. 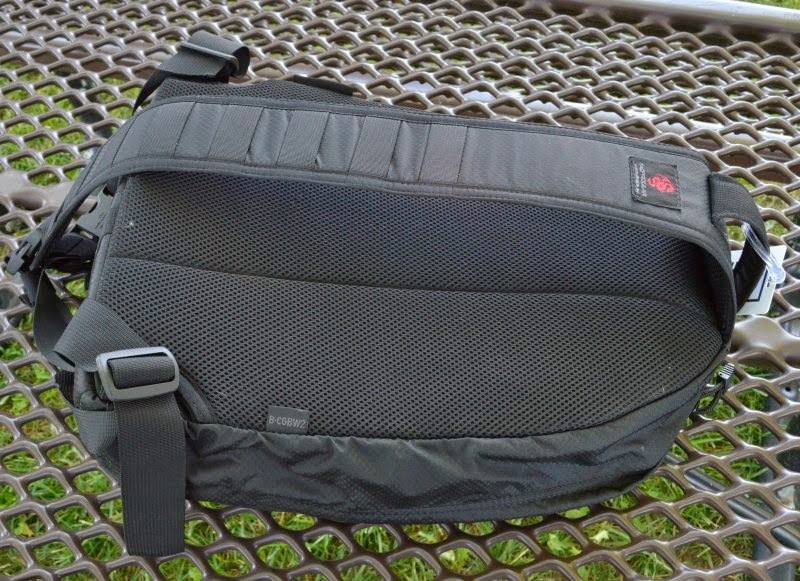 The front CCW compartment is dual zippered-sided for ambi-access for righties/lefties. 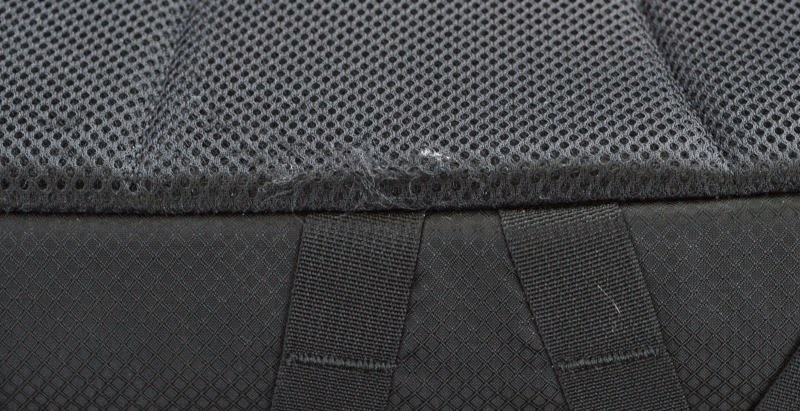 Internally, the compartment is covered with a field of Velcro which allows the included CCW tactical pistol wheel to be attached and positioned as required. The wheel, which looks like part of a kid’s toy, has a few straps to provide retention for almost any pistol or revolver. I did note that due to the extreme thin and lightweight fabric, you do need to be conscious that some guns will print more than others and that a notepad or glove may need to be placed on top of the pistol to break up the profile. Inside main compartment, is a larger zippered pocket, the cavernous main compartment space and a hidden velcro compartment which will accept a standard 10x12 ballistic plate. TacProGear kept the compartments to a minimum to reduce weight, but provided the abiliaty to carry an armor plate. Including Ballistic armor plates in backpacks has become all the rage now even for kids in school to help the kids have a fighting chance in “gun free zones”. 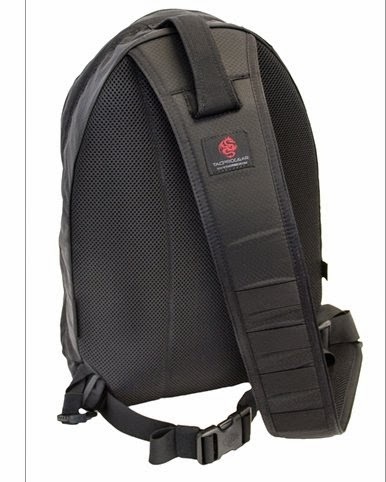 For the tactically minded on the campus or on the street it makes sense in a single strap sling pack which can easily spin into forward position to offer some amount of body armor protection and shielding. The body armor plate is available separately from a variety of sources. I am a fan of single sling packs for lighter loads simply because they are fast to throw on and off and comfortable with lighter loads. The Covert Go Bag has a fairly wide flat pad-less strap which dissipates pack weight and features ambidextrous loops on each side of the pack for right or left shoulder carry. 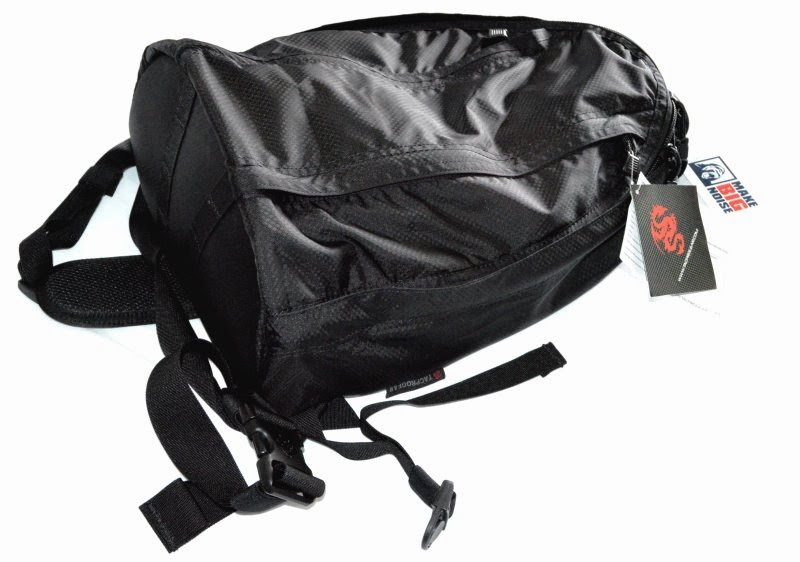 The wide strap is not particularly comfortable, however it does the job on a lightweight pack such as this. 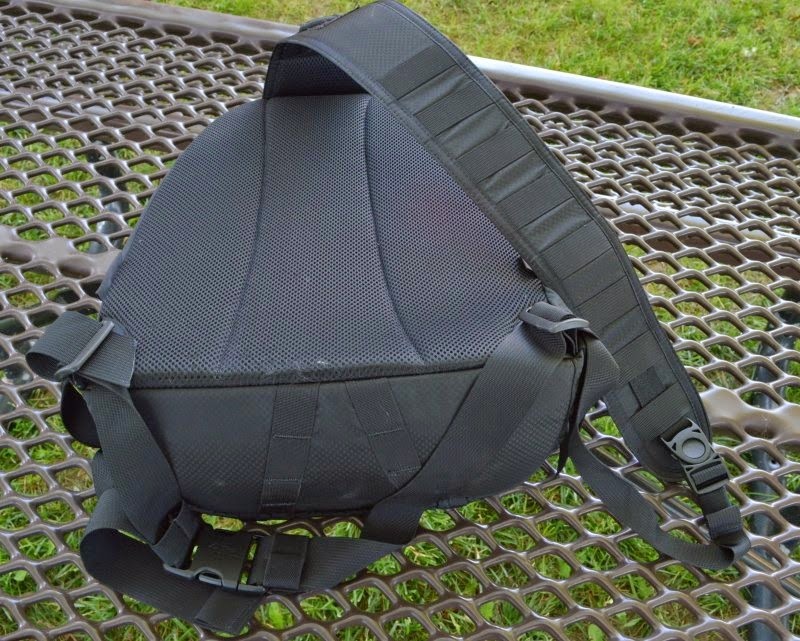 TacProGear did add an additional sternum strap to provide an option for more “active “ situations. Beyond a few MOLLE straps on the shoulder strap and on the bottom of the pack to attach additional accessories, the pack itself is void of any other MOLLE straps in order to save weight and add to it covert look. If a user is intending on putting a long haul beat down on a pack this would not be my first choice, however it would be on the top of my list if weight savings is a priority. The Covert Go Bag is about half the weight of any other pack this size I own and still does the job in a very affordable sub-$70 pack. If you overload it, expect some quick wear. If you are one of those extremely high speed guys, this is a simple and effective pack to be used as a plate carrier, a sub-machine gun, and a couple hundred rounds of ammo, however for me I just use this pack a lot is as a quick trip bag to just toss in a gun and light laptop or tablet device. Extraordinarily light pack for a great price for around $60 on the street.